Day 29 – Private versus socialist run enterprises…. Today I met with Wilson Barcos, founder of QUIMBOLSUR in 2009, and the man who helped Juan Pablo Selene of Quinoa Foods Co. with his first quinoa export shipment. I was impressed by the sophisticated, smoothly operating , operation I discovered at the edge of Salinas on the shores of the salt flats and also left wondering about the challenges and benefits of private versus socialist business models. Here’s the story. Wilson grew up in Salinas, the son of a long legacy of quinoa growers, his father grew quinoa, his grandfather, great grandfather, along down the line. 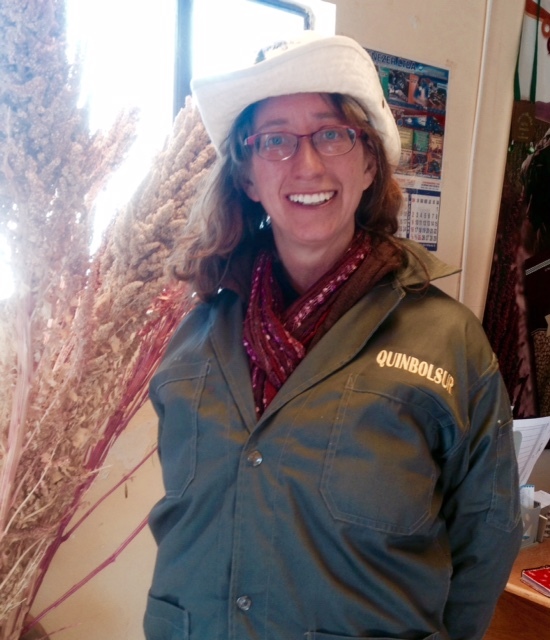 Being on the edge of the salt flats, they produced the most nutritious, hearty quinoa in all of Bolivia. A lot of this was due to the high mineral content of the soil which the plan absorbed and stored in its seeds and also the cold, arid conditions of the region. 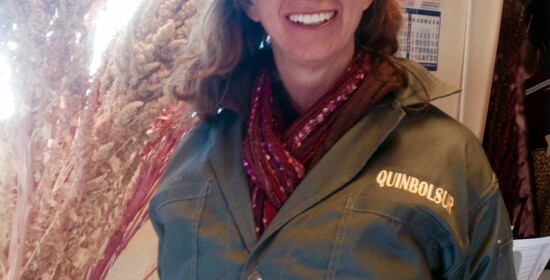 Like most people in the region, quinoa was grown for one’s one personal consumption and was an important family staple. This changed for Wilson in 2003 when world markets began stirring and more technical assistance became available for Bolivian quinoa farmers. This is when Wilson began thinking of quinoa as an income generating crop, not just a family food source. He started with sales in the regional quinoa market of Chayapata, three hours away, this is where he met Juan Pablo in 2010. Juan Pablo was looking for someone to help him export quinoa to a new USA client and asked Wilson to help. Contrary to what Juan Pablo has presented in his interview, this was Wilson’s first time exporting quinoa too. Somehow they were able to secure the funds and export the containers in the way Juan Pablo had presented, starting with one, then another and another until the delivery chain was well established and the quinoa easily entered in to the US market. Wilson said the two worked together for the next six or seven years, exporting containers together, though payment to Wilson for his quinoa from Juan Pablo kept coming more and more slowly. Finally the two decided to work more independently and split up, going their separate ways. Meanwhile, Wilson had been developing his own US contacts and exporting quinoa to ENRI, a US distributor. However this relationship ended when the company was purchased by Smuckers and they stopped placing orders. Wilson does not speak English and is at a disadvantage when it come to soliciting business for the US and other countries. He can not conjure up new business at large US natural foods trade shows such as Expo East and Expo West, like many other exporters do, nor can he search for new contacts online very easily. His daughter is studying commercial food processing in El Salvador perhaps she will return home and help him grow the business more, he hoped. Meanwhile Wilson is focusing on what he has and what he can do. He exported five containers of quinoa in 2014, is preparing to export his fourth container so far this year, and hopes to soon be strengthening ties to Fair Trade exporters who are more accessible to him since they come to Bolivia seeking product and speak Spanish. He also has a new drying system waiting get installed, a 2,000 square meter processing plant right in Salinas, the quinoa capital, and is currently processing mid-altiplano quinoa, a smaller variety of quinoa than what Wilson grows, for Jacha Inti, the processing arm of Sergio’s Andean Naturals company. Me, after touring the plant. Wilson has two full time agronomists working with him and a total of eight employees who take of processing. The processing has many more steps than the other plants I have visited so far. There is the initial cleaning of the grain, then the washing. Wilson has ultraviolet and high filtration cleaning systems installed so the wash water is of the highest quality. After washing, the grains are then dried and the outer seed covers removed. Anther cleaning phase ensues and then the seeds go through two selection stages where colors and sizes are separated, resulting in a very clean, unified product. All of this is done though immense processing machines. Quinoa naturally has variation in its seed colors ranging from black to maroon, red, pink, yellow and white. Wilson makes sure that Sergio’s quinoa is pure white. 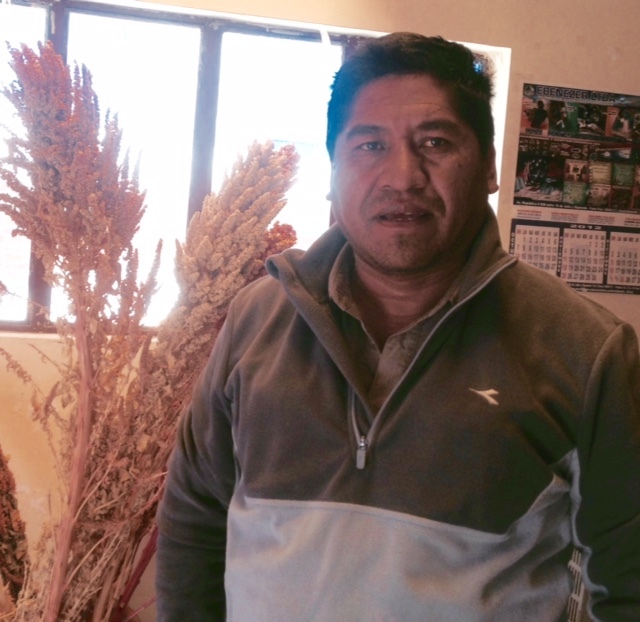 Wilson hopes to be competitive in his quinoa production by specializing in the highly nutritious Quinoa Real of the southern altiplano. Here he has 135 certified organic producers who provide him with quinoa. He is working with his agronomists to cultivate higher yields for them. Each farmer has about eight to 15 hectacres to cultivate and no more, so they way to cultivate more product without using more land, explained Wilson, is to increase yields. His method largely includes using higher amounts of organic fertilizer. The farmers that work with him collectively have a total of about 800 llamas. Currently the average regional yields are about five to eight quintals per hactacre. Wilson claims has been able to increase this by more than 500%, producing 45 quintales per hectare, largely by using more llama manure. In 2009, Wilson helped his producers to form the Association of Organic Producers of Inter-Salara Quinoa Real (APROQUIERES). He hopes with the independent association, he can get a fair trade certification from the Fair Labeling Organization (FLO) who works with Bolivian quinoa certification and provides training, infrastructure and export market access. This certification will cost Wilson $7,000, but it is something he sees a good future in. He is also working to strengthen his connection with Andean naturals and enter into their Fair Trade market, certified by Fair Trade USA as well. I was impressed by how much Wilson had achieved on his own. All of the other plants in the region had been gifts to the people from other organizations; the Bolivian government, European Union, and were managed by a vast membership who shared risks, costs and through their organization, qualified for many technical assistance programs and benefits. Here was a local man who apparently of his own accord, amassed quite a sophisticated operation on his own and did not receive any outside help. In fact the Bolivian government, who is very pro-producer, does very little to support private enterprise and has a general mistrust of private enterprise development in general. I also thought back to my conversation with Emily Kawano of the US Solidarity Economy Network (US SEN) in the US. Here she explained the difference between a social enterprise, which is a business that provides a social good or service, such as fair wages, and a positive environmental impact versus a socialist enterprise, which is one that is managed and directed by the workers themselves. 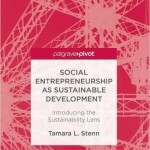 Though both businesses can end up achieving the same social results, for example, fair wages and a positive environmental impact, the people in the social enterprise are dependent on the kindness and good intentions of the owner to maintain the business. I asked Wilson about his thoughts on this, as a private business owner, in a region where social business ownership was positively valued and more the norm. I reminded Wilson that he was affected by the vulnerabilities of private ownership, when Smuckers bought ____ and he lost an important client. We both thought about this for a while. I mentioned observations I had made in prices. Juan Pablo, an organic distributor was paying around 600BS a quintal for his quinoa, sourcing it largely from the Challapata free-market. Wilson said he was paying about 700Bs for his own locally produced, organic inter-salar brand, the members of the Fair Trade APQUISA organization were looking to get about 900 to 1000Bs for their organic production. Wilson smiled and turned to me, “Yes,” he said, “they will be paying 900 to 1000 Bs for their quinoa but what will they have left for maintain their machinery, making repairs, buying new equipment? This was given to them as gifts. They do not know the cost of maintenance and improvement. These association work for a while, but then there are decisions that need to be made and there is no agreement in them and things fall apart. That is the difference.” I know that APQUISA does maintain a fund for the organization, but it will be interesting to see how they manage and value this at the annual meeting next week. I think back to the PPQA meeting the other day and the abandoned plant with tens of thousands of dollars of equipment, unused and ruined, and had to nod in agreement. And I think of development economics and the dependency models that develop as people are given handouts without having a chance to earn them or provide a service in return. Then I think of the new plant in Otuyo, with so much community buy-in and large amounts of matched funds. I ask Wilson if he things that a more hybrid approach of ownership where the community has more of a stake in the outcome could make these types of producers associations more efficient or careful in how they operate. He shrugs. He points out that his apronomers are in the producer communities every day, that is where they work. Meanwhile the APQUISA agronmer sits in his office. That is true, the APQUISA organization has more of a train-the-trainer approach to technical assistance where the main agronomist trains member representatives in techniques as needed. Wilson points out that he operates in a small region where everyone knows each other. They grew up together. He says that the APQUISA association is essentially his competition. Twenty-five percent of the people from a given community produce for Wilson, the rest are mostly associated with APQUISA. If, Wilson points out, he did not treat his producers well, and create value for them, they would not produce for him. They would leave and go to APQUISA or another organization. The proof of his good work, he explains, is from the people who choose to work with him. He can guarantee them much more market stability, growth and efficiency. He has his entire life invested into this company and has the power to see it succeed. This is where his private enterprise differs from the associations and where he sees his long term advantage. I had to agree, and I wondered as I return for more studies years down the road, what the future holds for APQUISA and the socialist growing organizations in the countryside. I wonder if there exists a hybrid model of this, a quasi-worker owned, quasi-central leader private market mix. There must. Doe sit always have to be either or. Can it ever be both?